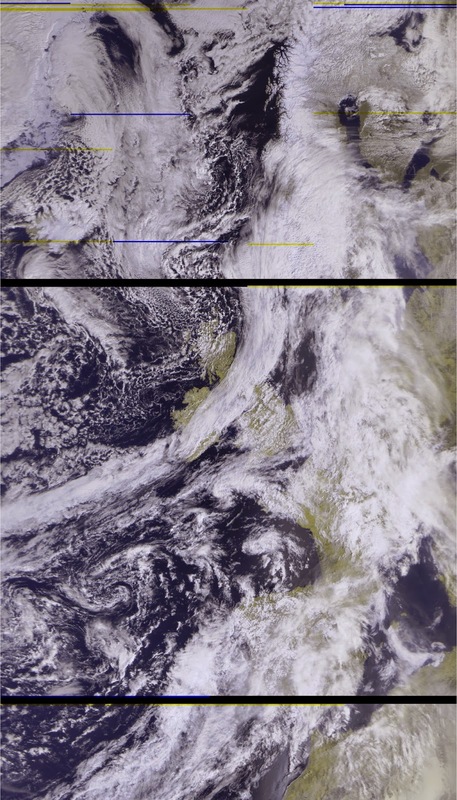 If you've got a HackRF you can easily use it to receive pictures from weather satellites in low earth orbit without tracking antennas, just like the one above (NB. the two thick black lines are a fault with the spacecraft and not with my reception!). NOAA have several LEO weather satellites in operation but these only transmit an older, lower resolution picture. The newer NOAA satellite had a problem which means that it does not transmit in the VHF frequencies. However, the Russian satellite - Meteor M-N2 - is operational transmitting LRPT in the 137 MHz band. 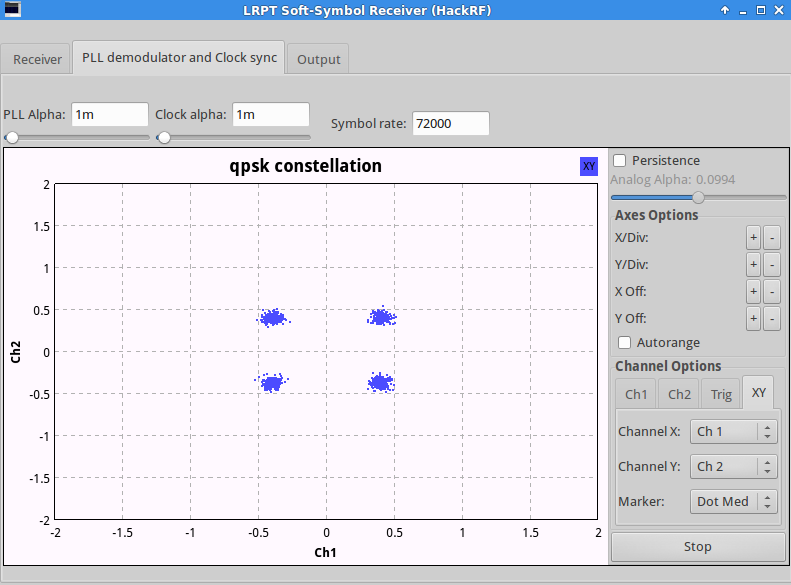 There is a method of receiving these pictures on Linux using cheap RTL dongles (there are also methods on Windows which I will not cover) and I have adapted this method to work with the HackRF. 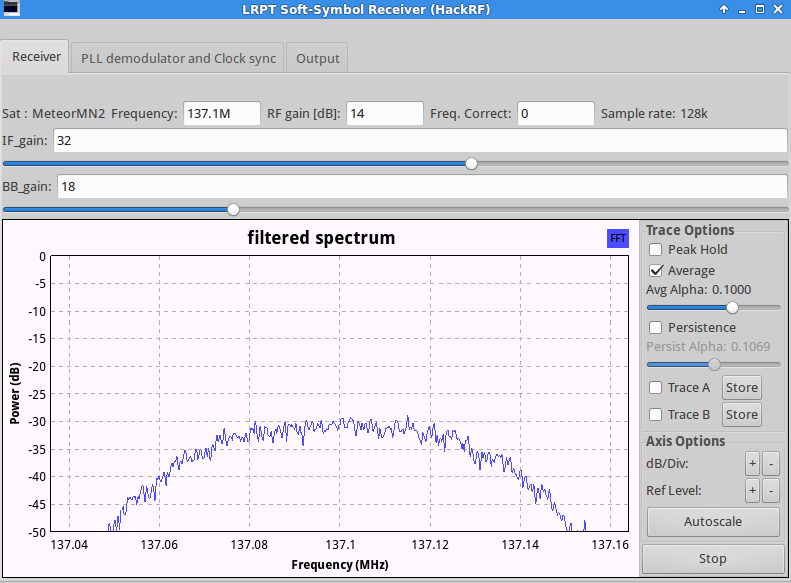 Specifically I have also moved the receive frequency of the satellite away from the centre frequency the HackRF is tuned to. This avoids the centre DC spike and associated problems. In the UK the satellite band is very close to wide area pager frequencies, this leads to considerable breakthrough of pager transmissions into the very weak satellite signals. This interference causes the couple of yellow and blue lines in the image above. What I have found is that this method of reception with the HackRF is much less susceptible to pager problems that when using an RTL dongle. It is also more sensitive compared to my RTL dongle leading to images received to lower elevations (where the signal is weakest). Then simply run it by typing ./meteor_qpsk_rx_hackrf.py from the directory that you copied it into. When the satellite is close I see a spectrum like the screen shot above, and the constellation like the screen shot below. To work out when Meteor M-N2 is going to be nearby use the GPredict satellite tracking program. Once the soft symbol.s file has been received using this program then it is time to open Oleg's LRPTOffLineDecoder program to produce the image. This is a Windows program but runs well under Wine in Linux. The image above is a part of the window of Oleg's program. Click the "72k" button (as the satellite is sending data at a symbol rate of 72k but it has also sent at 80k). 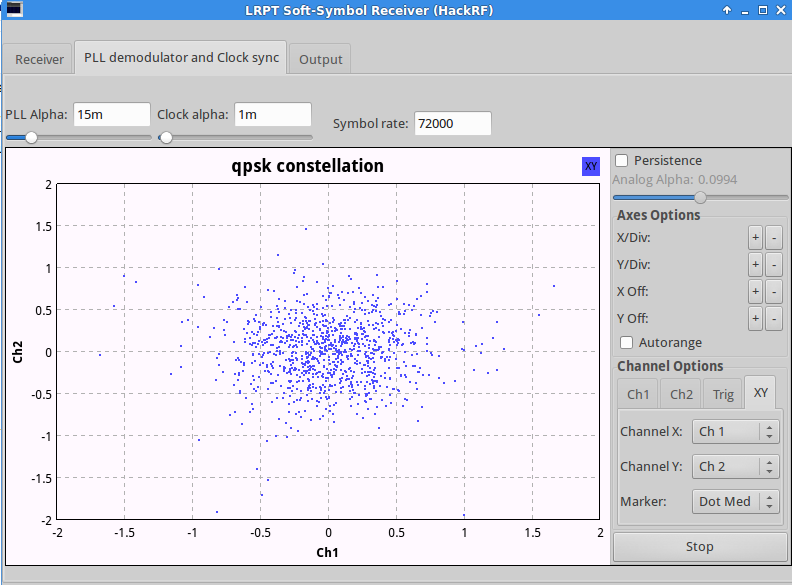 Navigate to the place on your hard drive where the .s output file from the GNUradio program is stored, select the file and click ok.
You should see the two progress bars start to move and the constellation of the received signal show in the top left hand side of the window. This step can take some time. If the image can be decoded the infrared/visible channels received will be shown to the right hand side. Click "RGB" to generate a false colour image, you need to select the RGB drop down lists to correspond to the wavelengths that were received otherwise you will just get an all white or black image. You can also change the RGB settings to change the colouration of the image. At this point you can also save the image. Oleg's website has other examples of images received plus links to the software etc. You can see other images I have received here. NB: for nightime images only the infrared wavelength is usable (normally 10.5-11.5) so set the RGB settings all to 10.5-11.5. To achieve an image you can make sense of you will need to load the resulting image into GIMP and flip it horizontally, flip it vertically then invert the colours. Then adjust the contrast and brightness to bring out the land/sea by trial and error. The image below is a night time image. This has not been rectified to take out the curvature of the earth as the image at the top of this post has. The best antenna to use is a QFH, this link has details of how to build one. However, you could use a Crossed dipole, egg-beater (really! ), or a simple quarter wave. 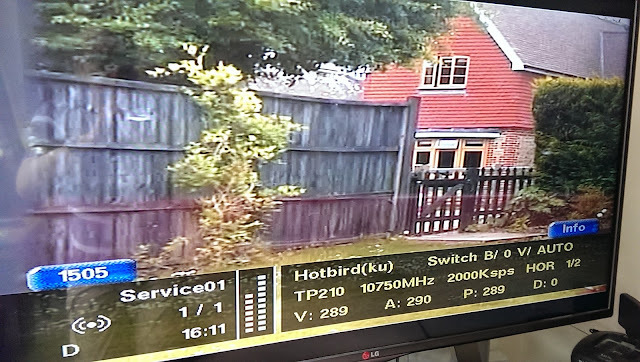 You will receive something on a good overhead pass on a quarterwave or an amateur 2 metre antenna but don't expect images like the ones on this page. Of course, whatever antenna you use it should be as high and as in the clear and outside as possible. Having said that my QFH is pushed up through the branches of a tree. I also use an old 2 metre pre-amplifier to give the signal an added boost.